DON'T BE FOOLED: BREXIT was about Inequality not Immigration. Why won't politicians, pundits and social media realise this? Wind farm subsidies will end a year early. 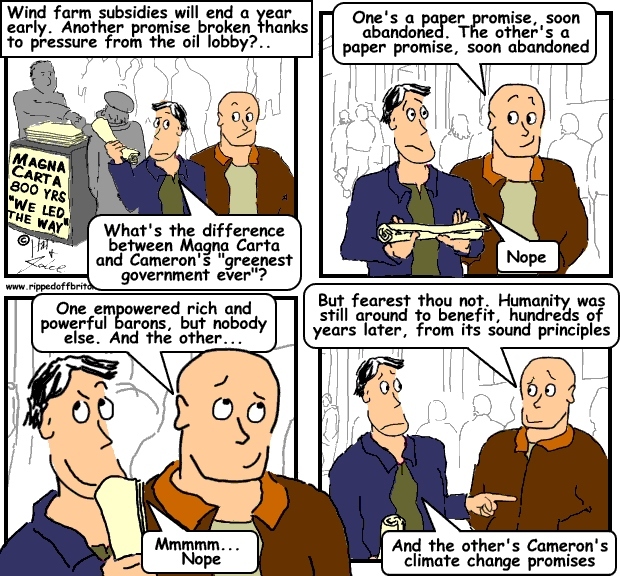 Another promise abandoned thanks to pressure from the oil lobby? New onshore wind farms will be excluded from a subsidy scheme from 1 April 2016, a year earlier than expected. There will be a grace period for projects which already have planning permission, the Department of Energy and Climate Change said. The funding for the subsidy comes from the Renewables Obligation, which is funded by levies added to household fuel bills. The Conservatives promised in their manifesto to hold down bills and increase renewable energy. But onshore wind is the cheapest readily-available form of clean energy in the UK. That's why some experts have described their decision to kill the onshore wind programme as bizarre and irrational. Some of the business leaders are baffled why ministers will give local people a unique veto over wind turbines, when they cannot veto shale gas fracking or even a nuclear power station on their doorstep. The UK has the worst investment record of the 27 EU nations. So where does all the money go? Labour exposes OFGEM’s failure to stop the Big 6 energy firm rip-off. Why didn’t they do that when they were in power? Graphs at a glance: OFGEM finally does something useful by publishing wholesale energy prices! See energy companies' bogus reason for hiking prices exposed! Graphs at a glance: Will fracking bring cheap energy to Britain? The evidence suggest not. Graphs at a glance: When it comes to the election once again "It's the economy, stupid" that should decide it. Not the national economy, but the economies of individual families. BREXIT was about Inequality in Britain, not Immigration. Have our politicians realised this? © 2010-2017, Hari and Jake. All rights reserved. Powered by Blogger.